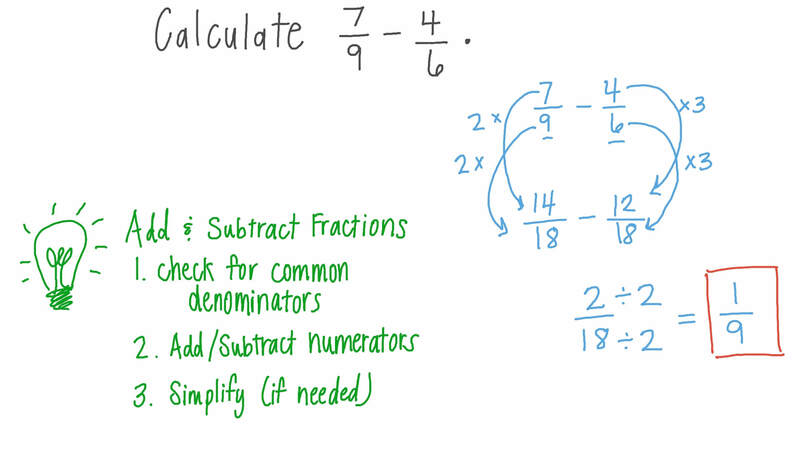 In this lesson, we will learn how to subtract fractions with unlike denominators. A mirror’s length is 2 3 of a foot, and its width is 3 8 of a foot less than its length. 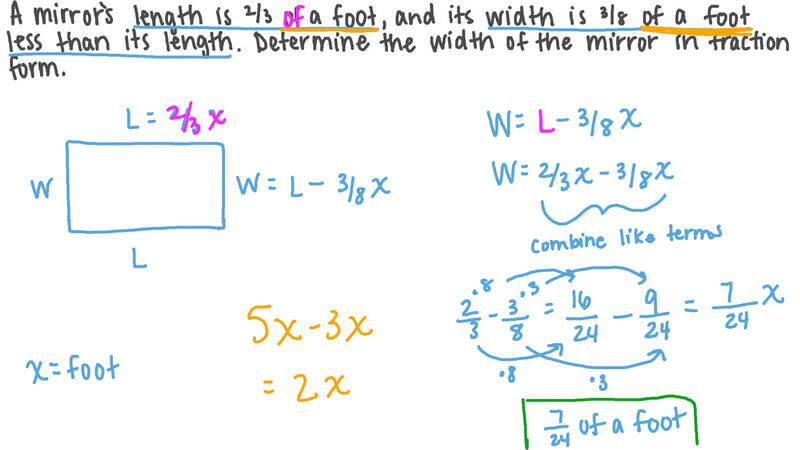 Determine the width of the mirror in fraction form. Calculate 7 9 − 4 6 . How much more is 7 8 of a gallon than 3 4 of a gallon? Samar walks h to work on Route A and h back to her house on Route B every day. Which route does she spend more time on and by how much? Evaluate 𝑥 − 𝑦 , given that 𝑥 = 4 5 and 𝑦 = 3 4 . Evaluate 𝑎 − 𝑏 𝑎 + 𝑏 given 𝑎 = 3 2 and 𝑏 = 2 3 . Give the answer in its simplest form. Calculate 7 8 − 1 2 − 1 3 giving the answer in its simplest form. 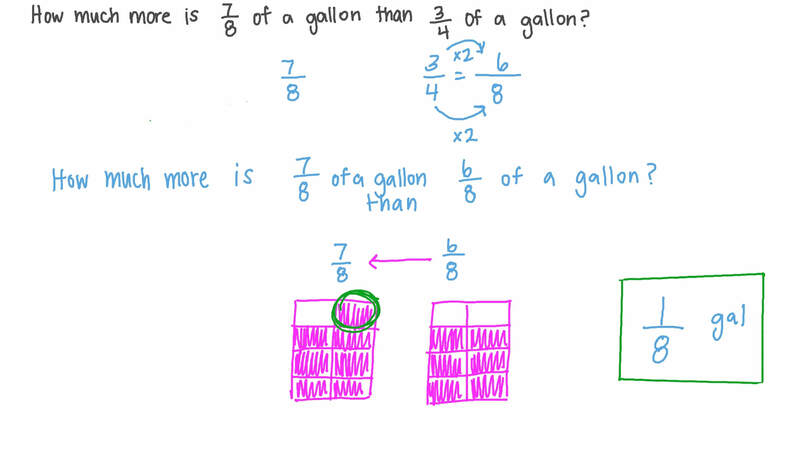 Use the order of operations to evaluate 2 5 − 2 3 + 4 9 , expressing the answer in its simplest form. A supermarket is of a mile from Sally’s house and of a mile from Amira’s house. How much farther is the supermarket from Amira’s house than it is from Sally’s house? A baby’s bottle can hold 2 3 of a cup of milk. In order to feed her baby, the mother filled the bottle to the top with 1 4 of a cup of milk. Determine how much milk was already inside the bottle. Nader lives mi from the school, and Sherif lives mi from it. Who lives closer to the school and by how much?